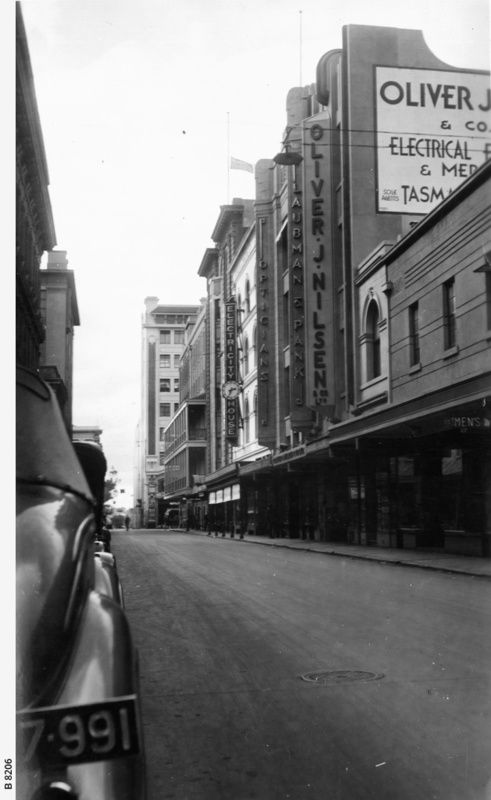 [General description] Looking along Gawler place towards Rundle Street. The premises of Oliver J. Nilsen and Laubman & Pank are on the left, Electricity House (with the clock) is a little further along. [On back of photograph] 'Acres 105 and 82 / Gawler Place, east side / 8th April 1939 / Nilsen's building was completed in 1938 / Compare with B 4846 / The near side of Nilsen's building is 51 1/2 yards north of Grenfell Street; frontage: 7 yards'.